It came two weeks late because of the recent federal government shutdown but President Donald Trump was able to give his State of the Union address last night. President Trump spoke before Congress and the nation for 90 minutes, saying the state of the union is strong. The President emphasized immigration when he repeated his promise to build a wall along the southern border. He announced that 3,750 more troops will be sent there. That was met with disapproval from House Speaker Nancy Pelosi who sat behind him with Vice President Pence. Pelosi and the Democrats have vowed not to fund such a structure. This is what caused the President to shut down the government last month. The speech was in the House chamber where many newly elected female Democrats wore white as a tribute to the suffragist movement. One aspect that drew a divided response is the current investigation into the President’s relationship with Russia. 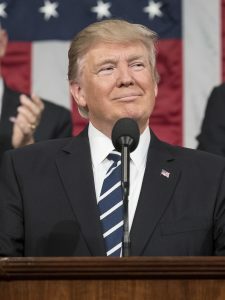 While President Trump touted the financial outcome of some of his policies, he said that an active investigation should not obstruct the government from getting things done. “If there is going to be peace and legislation, there cannot be war and investigation,” President Trump said.